Have a "sweet" art idea that represents the Oxnard happening well? Best submit it soon. Find inspiration in the famous fruit as you create the (fingers crossed) next winning design for the Oxnard May-merry party. 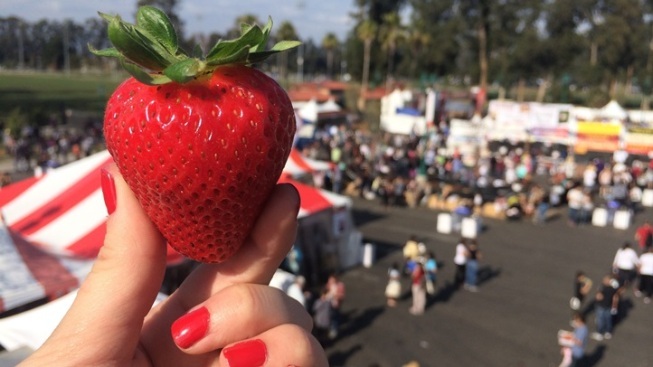 ANNUAL POSTER CONTEST... for the California Strawberry Festival, the moment is ripe. The prize is $2000, plus the chance to see your artwork touting the popular festival. You can see what past posters have looked like, for inspiration, at the festival's site, or perhaps you just need to visit the produce drawer in your fridge to summon a great idea. Whatever path you take, think of the sort of design which might best represent the festival, which celebrates its 35th annual year on Saturday, May 19 and Sunday, May 20, 2018. Artwork dimensions, rules, more guidelines? All right here and here. Perusing winners from years gone by? Always fascinating to see the themes, hues, fonts, and other details change of the years (and, yep, strawberries are always the stars). Eye those now, then jump into an early contest now, one that doesn't even require you to wear a strawberry-bedecked hat or to toss a strawberry tart. Unless, of course, both of those things give you inspiration, then definitely go for it.